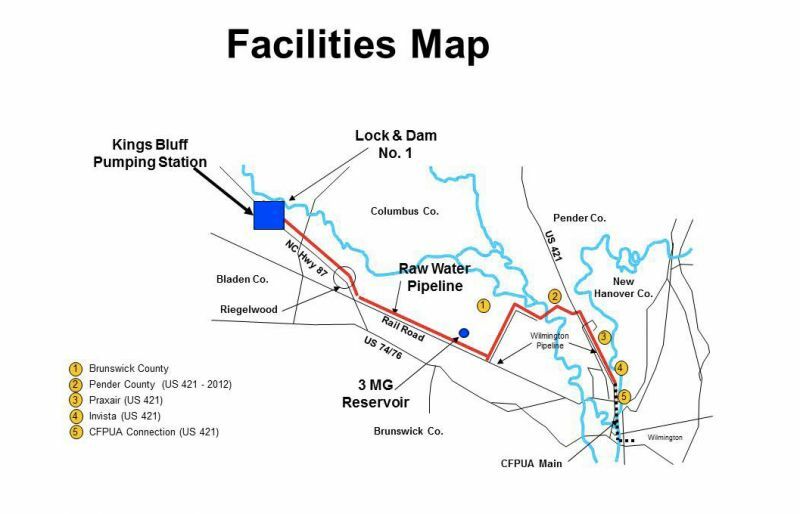 The Kings Bluff Raw Water Pump Station is owned by the Lower Cape Fear Water & Sewer Authority and is operated under contract with the Brunswick County Public Utilities Department. 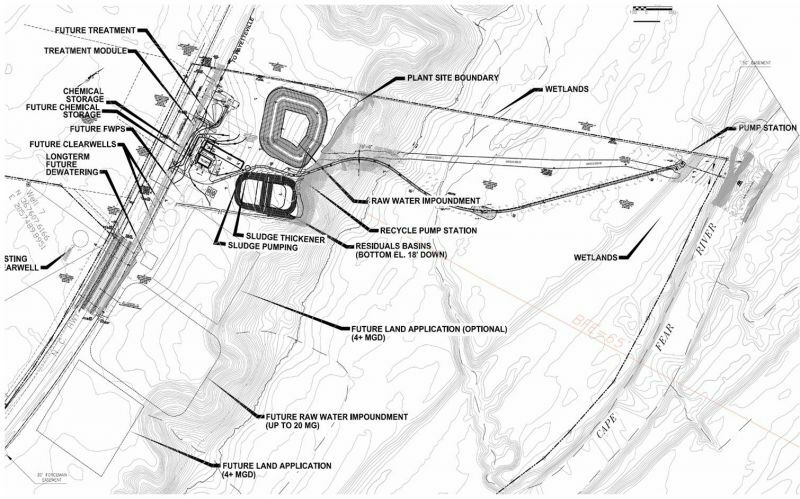 The original pump station design, located in Bladen County, included three (3) 1000 horsepower (HP) vertical turbine raw water pumps with one being a diesel pump in case of loss of electrical power. The raw water supply from the Cape Fear River to the pump station was provided via three (3) Johnson screens on the bottom of the river behind Lock and Dam #1 with a 48 inch intake pipeline to the station with a pumping capacity of 45 million gallons per day (MGD). The 1984 construction phase also included approximately 14 miles of a 48 inch transmission line and a three million (3MG) storage reservoir to maintain pressure in the system. The purpose was to provide a raw water supply to Brunswick County's Northwest Water Treatment plant with a capacity of 24 MGD built during the same period of time. An extension of the 48 inch transmission line (to include a 60 inch section) approximately 10 miles to US Highway 421 was completed in 1992. This construction phase added the City of Wilmington, Praxair and Invista to the Authority's customer base. In 2002, the Authority secured two (2) diesel powered 2.7 megawatt generators to provide backup power capabilities to the station, enclosed in a separate building, to provide a reliable and uninterrupted water service to its customers 24/7/365. In 2007-2008, the Authority expanded the size of the Kings Bluff Raw Water Pump Station by adding two (2) additional wet wells and purchasing three (3) 1600 HP vertical turbine raw water pumps with variable frequency drive electric motors. Each of the new pumps have a capacity of 32 MGD. The expansion included a state of the art electrical building and a new control room for operators with amenities.